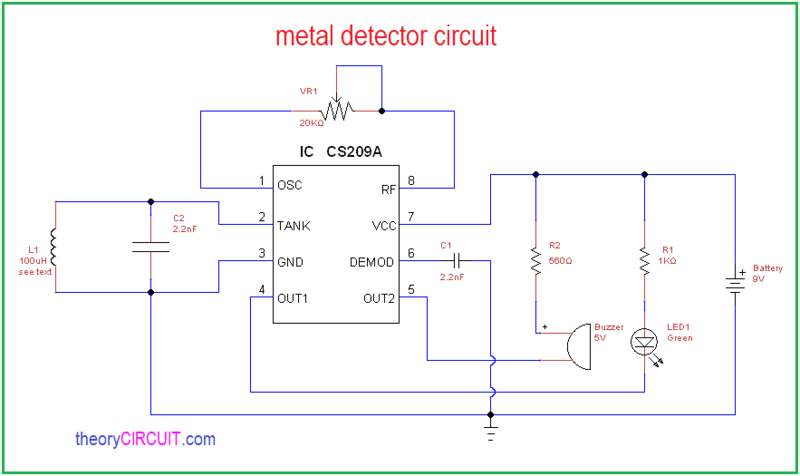 Simple metal detector circuit is Implemented by employing IC CS209A from cherry semiconductor (now its on semiconductor), the CS209A is a bipolar monolithic integrated circuit for use in metal detector applications and Inductive proximity sensing applications. 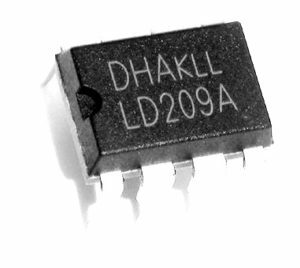 This IC consumes 12V single power supply and utilize 6mA current during operation, it can provide output current sink capability up to 100mA, and IC CS209A comes in 14 pin and 8 pin configurations, and also it is available in DIP 8, SOP 14 packages. Here DIP8 package CS209A taken for prototype of metal detector circuit. Pin 1: OSC – Adjustable feedback resistor connected between Oscillator and RF sets detection range. Pin 2: TANK- Connects to parallel tank circuit. Pin 3: GND- Ground connection. Pin 4: OUT 1- Complementary open collector output; When OUT 1 = LOW, metal is present. Pin 5: OUT 2- Complementary open collector output; When OUT 2 = HIGH, metal is present. Pin 6: DEMOD- Input to comparator controlling OUT1 and OUT 2. Pin 8: RF- Adjustable feedback resistor connected between OSC and RF set detection range. Important part in this circuit is designing the Inductor coil L1, because the sensitivity and output result are based on this Inductor only, here L1 value obtained to 100μH using Insulated copper coil 0.4mm wire, the L1 has 40mm in diameter and made of 50 turns. 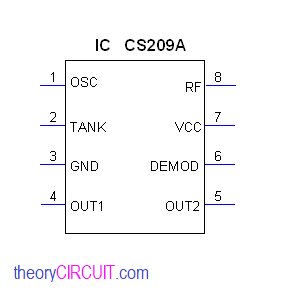 The IC CS209A has internal oscillator circuit and L1 acts as tank element, hence the change of inductance in L1 near metal objects and it makes output 2 as high. In this circuit OUT 1 is connected with LED and OUT 2 is connected with 5V buzzer, this buzzer makes noise when the metal is detected. Sensitivity of this circuit can be varied by using variable resistor VR1. For this circuit the detector coil L1 should be near to the metal objects in order to detect and give buzzer sound.